The starship Robert E. Lee is bearing a controversial cargo on its return to Earth: the only surviving crew of the EASS Galileo. This ship and all aboard vanished decades previously, while examining an apparently alien artefact. As John Shillinglaw, director general of the European Space Agency, waits nervously for the vessel to dock, he ponders the mystery. First Officer Theodore Harker, astrobiologist Jared Ramirez and pilot Emily Collins have been missing for fifty-six years. Where have they been… and why have they returned now? While Spindrift is clearly set in the same world as the other Coyote novels, with the same political tensions and difficulties, readers don’t need to have read any of the previous books to be able to easily access the story – a major plus as far as I’m concerned. However, I came to Spindrift after reading the previous trilogy, which is the tale of a planet colonisation, leading to a war of independence from Earth. There were classic elements from Steele’s other novels – the political manoeuvring, leading to stupid mistakes being made. 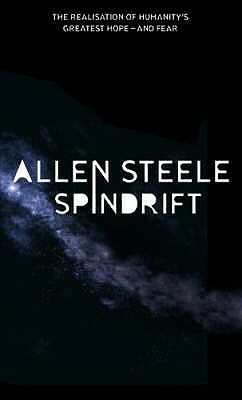 That strand certainly plays to Steele’s strengths – he is good at ramping up tensions between suspicious individuals and the Galileo’s outward journey provides a strong backdrop for these tensions to nicely fester. I also really enjoyed the exploration of Spindrift, the enigmatic alien object. Steele manages to evoke the sense of wonder and excitement, as well as danger, while his three protagonists are confronted with the very first alien artefacts seen by humans. It is a staple of science fiction writing and all too often, authors are so carried away by telling their particular stories, they fail to take the time to adequately convey just what a big deal this event is. Not so Steele. So far, so good. However, I do have several problems with this book, which in my opinion, isn’t as strong as his previous offerings. The first is the basic structure. As the blurb suggests, the book starts off in John Shillinglaw’s viewpoint as he waits to interview the three survivors of this expedition. Then the story is told from the viewpoints of the three main protagonists throughout the adventure, and then right at the end, it reverts back to Shillinglaw – as if the whole intervening narrative is in flashback, before the conclusion. This has two effects – the first is that throughout the storyline of the expedition, we are aware that only Ted, Jared and Emily survive. So certain key moments are robbed of their shock or surprise value – we wait to discover in what way the Galileo comes to a sticky end, rather than being shocked that it happens. If a writer is going to pull that kind of stunt on his readers, he needs to provide another surprise – or make the characterisation so engrossing and original that the fact we already know several big spoilers doesn’t matter. Steele doesn’t provide either, so while the story is effectively told we already know too much, which robs this tale of a lot of its potential impact. The other aspect is that as Shillinglaw ‘bookends’ the whole narrative, his character really needs to leap off the page, or he needs to provide a keynote role that helps to satisfactorily wind up the plot to a proper ending. In my opinion, Steele didn’t manage to fully persuade me that Shillinglaw’s contribution to the whole business was sufficiently important – and as for creating a really strong character – that isn’t one of Steele’s innate strengths, anyhow. As a woman, I was particularly frustrated with Emily’s character – I felt she was very much the ‘token’ female – the fluffy, submissive kind. We kept being told that she was a wonderful pilot, despite the fact that she had all the drive and personality of a wet flannel. Both the male protagonists were a lot more interesting and I found myself wishing that Steele had stuck to making all three protagonists men. However, all that said – it is still a worthwhile, reasonably enjoyable read. My frustration with the book is that if only Steele had restructured the story differently, it could have been so much better.